Morning everyone, and welcome to a new installment in the Catholic Book club! 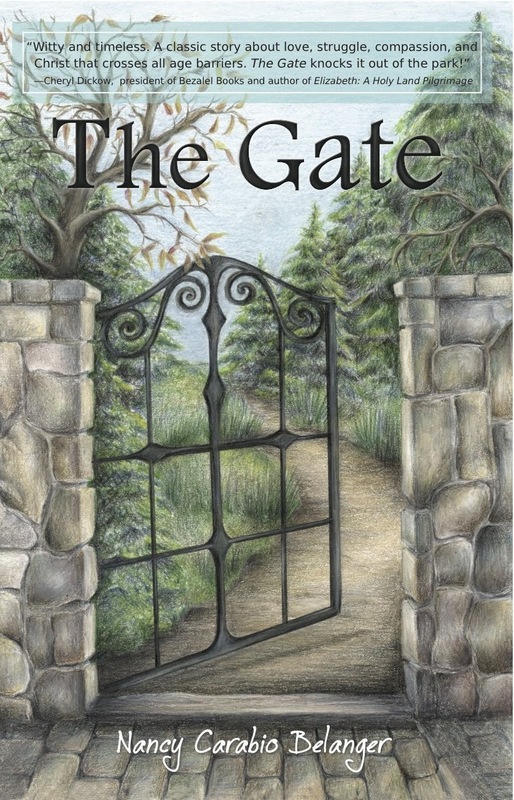 The book I'll be discussing today, The Gate by Nancy Carabio Belanger, is the first in a slew of Young Adult novels that I have been asked to review, and I am thrilled to include this genre on the blog! Our story centers around a 13 year old character, Josh, who is struggling emotionally and behaviorally since the death of his father several years prior. Both he and his mom have abandoned the Catholic faith that had been so meaningful to them during his dad's life, and Josh, now in public school rather than their former parish school, is acting out regularly, getting poor grades and not nurturing his preexisting friendships. His mom is burying her grief in her work, leaving Josh at home to fend for himself a lot, and he is beginning to get into more trouble, playing video games and reading books with darker elements to them, and sometimes stealing small items. As part of a school project that he is immediately disdainful of, Josh is assigned to become a pen pal to a patient at a local nursing home. His pen pal is a older man named Pietro, nicknamed "Pie," recovering from hip replacement surgery, and Josh wants nothing to do with actually getting to know him. He wants to fulfill the assignment so that he won't fail his class, which he is on the brink of doing. His first letter goes unanswered, which rubs him the wrong way from the outset. When the class goes to visit their pen pals, Josh is prepared to gather the facts he needs to write his paper and be done with it. Instead, he finds that the feisty Pie, who talks a lot about his love of the Yankees and his Catholic faith, captures something in his imagination that he can't quite put his finger on. He and Pie never end up exchanging letters, but instead Josh finds himself at the nursing home quite a bit, visiting Pie. Pie also lost his father as a child, and the two have that in common, forging a bit of a bond over that painful wound. There are also things about Pie that Josh wonders about, little mysterious pieces of his story that keep him interested enough to keep visiting. One day, Pie makes a deal with Josh: every day, he'll leave one of his prized, collectible-quality baseball cards plus a slip of paper with a scripture verse on it, beneath a loose landscaping stone near the nursing home's beautiful garden gate. If Josh is so inclined, he can look up the verse in his Bible, dwell on it and ask Pie any questions he has about it and how it relates to his life's journey. But regardless of whether he looks up the scripture or not, he can keep the baseball card and do whatever he likes with it. Given that Josh is trying to save for a new video game, one that he knows his mother would never buy for him due to the violence and dark spirituality it espouses, he is eager to acquire the baseball cards and sell them. He agrees, intending to pay no mind to the scripture verses. And...things don't turn out the way Josh plans. :) Not with Pie, not with the scripture verses, not with the video game he is so obsessed with, not with his friends, and not with his dormant faith. To find out what happens, you need to read the book. And please, READ THIS BOOK. I *loved* it. Every night, I couldn't wait to get home to read what happened next. I plan to actually RE-READ this book at a future point, and that is the ultimate stamp of endorsement from your Catholic Librarian. I also plan to lend this book to Henry in a few years so that he can read it when he is closer to Josh's age. It is inspiring, it is lovely, it is thought-provoking, it has an ending that made me cry. Multiple times. This is an absolutely worthwhile book for middle school aged children and adults alike. Nancy has two other books available via Harvey House Publishing, Olivia and the Little Way and Olivia's Gift. If you order via the publisher, you can have them inscribed by the author and shipped for free. I am planning to order *both*. For me. And I suppose Henry and Anne will enjoy them too. :0 I am seriously impressed over here. Do check these books out, dear reader. Catholic authors providing such quality writing need our support, and our children need this type of faithful inspiration. Has anyone else read any of Nancy's books? Please leave me a comment! I have read this book, and also Olivia and the Little Way. I wish Nancy had been writing when my boys were young--and when I was young, too! But her books are every bit as satisfying and edifying for adults. I just loved them. The Gate is such a beautiful story, beautifully told. And I'm with you--Catholic authors providing books like this need our support!